This is my latest experiment making a whimsical cake. This cake was inspired by the original topsy-turvy cake designer, who also did my wedding cake years ago, Polly Schoomaker in Portland, Oregon. Although she is no longer in business, her cakes leave behind a legacy and a source of inspiration for all cake decorating fanatics. These are but a few of Polly’s incredible cakes. She brings a level of precision and balance that is unparalleled for an otherwise non-uniform cake. I started this topsy turvy cake as most others, with a sketch followed up by a computer design. 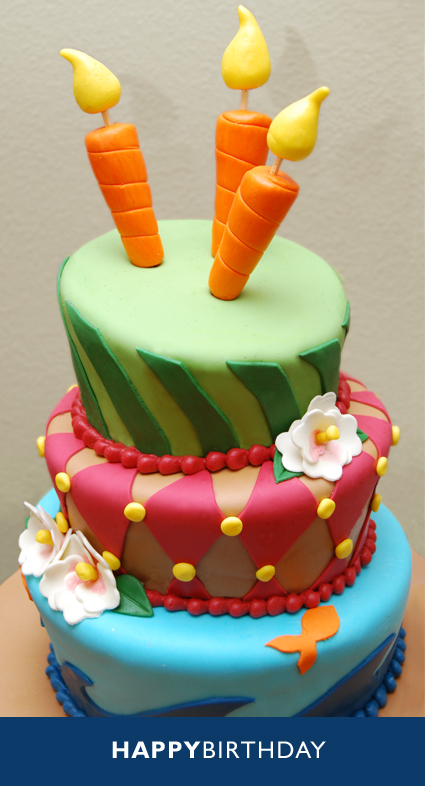 This allows me the chance to play with proportions, designs and colors without having to experiment on the actual cake. 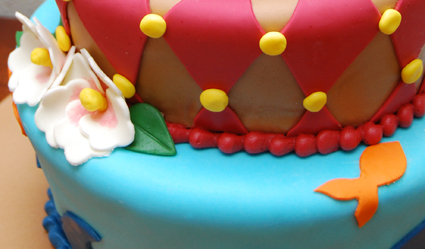 The next challenge is coloring the fondant to match the design. It is very rare that you can find just the right color off the shelf. These samples each contain a mixture of two or three food colorings to get the hue just right. 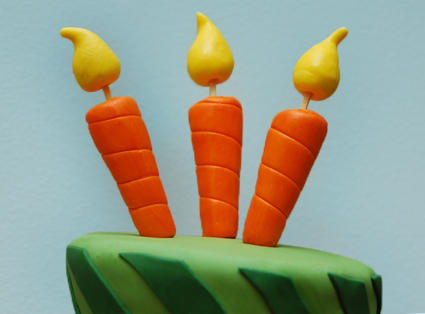 These over-exaggerated candles are the perfect fit to top off the cake. 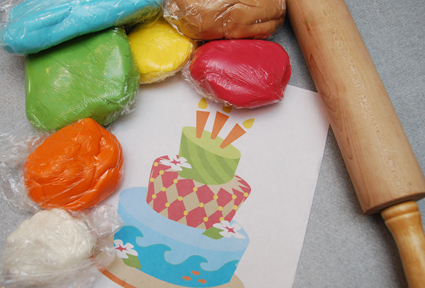 They are made of fondant that has been rolled, shaped, and ran through a skewer. The spiral effect on the candles is done by rolling the fondant with the back edge of a knife. Here is a close-up of the cake. The flowers and colors were inspired by the Hawaiian heritage of the birthday boy. A few little accents like the bright yellow dots and flowers give this simple cake a polished finish. Have I ever told you how incredibly talented you are? God has given you some wonderful gifts! So excited that your website is up! Such a cute blog! Trying not to lick the computer screen. I absolutely love your cakes. Where are you located? I live in Portland, Oregon. It’s not a business, just something I do for fun! I always inspired by you, your thoughts and way of thinking, again, appreciate for this nice post. I am honored! Sadly, however, I’ve made a decision not to pursue cakes as a business. The projects got a little too big and time consuming. I now only bake for immediate family and parties that I host at my own house. I’m so sorry not to be able to help. I’d be happy to help make a recommendation for local bakers if you’d like. Just let me know!